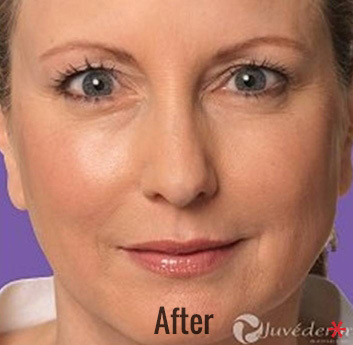 Juvéderm is a family of injectable dermal fillers that are used to correct signs of facial aging. Some common signs of aging that Juvéderm can address include lines and wrinkles around the nose and mouth and loss or lack of volume to the midfacial area and lips. Juvéderm can help take years off the face, without the need for an invasive surgery. 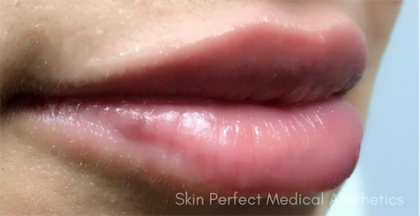 Feel free to request a consultation at Skin Perfect Medical Aesthetics to find out if Juvéderm – or our other range of injectables – could benefit you. Begin by contacting us at one of our three Southern California locations in order to schedule a consultation. Juvéderm® is a smooth-consistency gel made of hyaluronic acid—a naturally occurring substance in our skin that helps to add volume and hydration. However, with age, the amount of hyaluronic acid in our bodies begins to diminish – leading to the appearance of wrinkles, lines, and a loss of volume. Our medical aesthetic professionals use Juvéderm injectable gel under the skin to instantly restore the skin’s volume and smooth away facial wrinkles and folds, like “smile lines” or “parentheses” (nasolabial folds—the creases that run from the bottom of the nose to the corners of the mouth). Juvéderm is currently one of the most popular dermal fillers on the market, and for good reason! Our aesthetic professionals look forward to meeting with new patients and using their expertise to recommend how Juvéderm, or another injectable, could help our patients look younger and feel more radiant. Juvéderm is a hyaluronic acid (HA) filler that’s FDA approved and tested to last up to two years. The smooth consistency of the gel injects easily into the skin and provides a smooth, natural look and feel—so everyone will notice but no one will know! Derived from a naturally occurring substance that plays a vital role in hydrating the skin and replenishing its natural volume, no allergy skin tests are needed prior to receiving treatment. There is no human or animal DNA in Juvéderm. The procedure is quick to perform and patients can expect only minimal recovery or downtime, making it a great “pick me up” for men and women with busy schedules. The long-lasting results allow patients to feel confident both inside and out without needing to worry about urgently scheduling their next appointment. Healthy men and women concerned about volume loss in their lips or cheeks or the appearance of fine lines and wrinkles on the face may qualify as good candidates for Juvéderm. It is important that patients have good elasticity remaining in their skin when they receive dermal fillers. In some cases, patients may be better suited for a more invasive procedure. Juvéderm is only approved for patients who are ages 21 or over. They should also be physically and mentally healthy. Cosmetic change can be stressful not only on the body but also psychologically. It is very important that patient has realistic expectations prior to receiving dermal fillers. During the consultation, one of Dr. Kwok’s medical aesthetic professionals will determine whether or not the patient is a good candidate for Juvéderm or another dermal filler. Contact us today to begin. There are five formulations of Juvéderm to meet every patient’s needs. When a patient comes in for a consultation, our knowledgeable staff can help them determine which formula or formulas would be best for them. Juvéderm XC: The original Juvéderm is designed to smooth out moderate to severe facial wrinkles, including nasolabial folds and marionette lines. The results can last up to one year. Juvéderm Vollure XC: Vollure is designed to subtly soften the appearance of fine lines and wrinkles. The results can last up to 18 months. Juvéderm Voluma XC: With age, patients frequently begin to lose volume in the cheeks. Voluma is designed to lift and restore volume to the midfacial area. The results can last up to two years. Juvéderm Ultra XC: This formula adds fullness to the lips for up to one year. Juvéderm Volbella XC: Volbella is formulated to add subtle volume to the lips, while also diminishing the appearance of vertical lip lines. These results can last up to one year. Botox is likely the most well-known and popular injectable on the market. However, it is not designed to treat the same concerns as Juvéderm. Botox is primarily used to correct dynamic wrinkles, while Juvéderm is better at treating static wrinkles. Dynamic wrinkles form as a result of repeated muscle contractions. 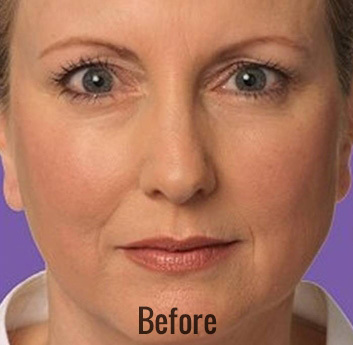 Botox temporarily freezes muscle contractions that lead to the development of these wrinkles. Botox works best when treating dynamic wrinkles, including horizontal forehead lines, vertical frown lines, and crow’s feet. Juvéderm is best for treating static wrinkles and volume loss. Juvéderm works by adding volume underneath the surface of the skin to soften fine lines and wrinkles and increase the projection of the cheeks and lips. Juvéderm is best at treating static wrinkles that form as a result of the natural aging process, heredity, environmental damage, and loss of vital nutrients – including hyaluronic acid – to the skin. These wrinkles – including nasolabial folds, marionette lines, and vertical lip lines that form around the nose and mouth – are present even when the face is at rest. It can also be used to add volume to the cheeks and lips. Our medical aesthetic practitioners and specialized injectors can help the patient determine whether or not they would benefit from Botox or a dermal filler like Juvéderm. Many of our clients use a combination of Botox and dermal fillers in order to achieve their cosmetic goals. The Juvéderm injection process is straightforward and can be performed in under half an hour, which makes it a fantastic option for patients with busy schedules. 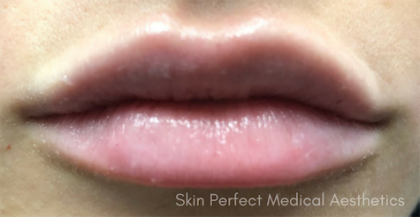 When patients come into one of our locations in Southern California, one of our specialized injectors will meet with the patient to administer the decided upon dermal filler formulation. The majority of patients find the injections very tolerable since they consist of lidocaine to aid in pain relief. Furthermore, the needles utilized for Juvéderm injections are very thin. However, our specialized injectors can numb the area with ice prior to treatment if the patient wishes. If the patient wishes to receive a topical anesthetic, then they should notify the office prior to the day of their treatment. Patients will be able to return to their daily activities following the procedure. However, we recommend waiting 1-2 days before engaging in strenuous activity and to always protect the skin from the sun. One of the perks of Juvéderm – and dermal fillers in general – is the minimal to no recovery period. The most common side effects include redness, itchiness, and slight swelling around the injection sites. This commonly lasts for a few hours, but may persist up to 24-48 hours. Patients concerned with the appearance of these side effects are permitted to cover up the visible areas with makeup, if they desire. Nonetheless, they are free to return to their daily routines. Patients may take over-the-counter medications that the medical professional recommends in order to combat any discomfort. In order to be considered for a dermal filler like Juvéderm, patients must first schedule an appointment for a consultation with one of our medical aesthetic professionals. We have several convenient southern California locations in order to meet our patients’ needs. The consultation is a time for the patient to learn more about the treatment and how it could uniquely benefit them. It is also a time for the specially trained injector to learn more about the patient, their goals, and how they can achieve these goals using Juvéderm or a combination of injectables. In some cases, the dermal fillers treatment may be able to be performed at the end of the consultation. However, we recommend that first-time patients take the time to consider dermal fillers before deciding on a treatment plan. The goal of the consultation is to make sure the patient feels completely informed so that they are confident in making the decision to get Juvéderm injections. We completely support patient’s needs to thoroughly consider the information they receive during the consultation prior to scheduling a treatment. At the time of the consultation, the patient will also be provided with a price quote for their treatment. The quote will take into account multiple factors, including the number and volume of injections required and whether or not the patient requests anesthesia. Potential Juvéderm patients should keep in mind that Juvéderm is not permanent, but rather a temporary treatment for facial wrinkles and volume loss. As a result, patients should be ready to commit to routine touch-up treatments if they wish to maintain their results. Nonetheless, it is a very practical treatment for patients who are not ready to commit to a long-term cosmetic change, do not want to undergo a surgical procedure, or cannot afford to take off more than a day for recovery. Our specially trained medical staff will assist the patient in making this important decision during the consultation. Contact one of our offices, located in Whittier, Rancho Cucamonga, Glendora and Brea, today in order to request a consultation and get started.